Be prepared for a SUPER engaging day! I transformed my room into a hospital triage room by using dollar tree table cloths and white butcher paper. I bought some manilla file folders, medical masks, non-latex gloves, Avery badge holders, and red syringe pens from Amazon to make the learning even more fun. With this purchase, you will receive 12 word problems to work as a group, 6 word problems for independent work, and 12 medical identification tags. ALL OF THESE ARE EDITABLE! That means you can change it to reflect your school's name, your kids' names, and add their name and picture to the I.D. badges. 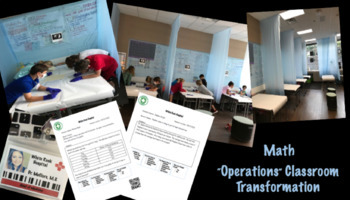 I stapled the 12 word problems into a file folder and students worked as groups to solve the medical themed problems using the 4 mathematical operations. They need to check a box to show if it is single step, two-step, or multi-step. Then, they will check the box to show which operation they will use to solve, and again to tell if the patient was cured. These have a QR code so students can easily check their work.